If the thumbnails of this article made you feel like you’ve seen this home somewhere, your hunch is probably right. 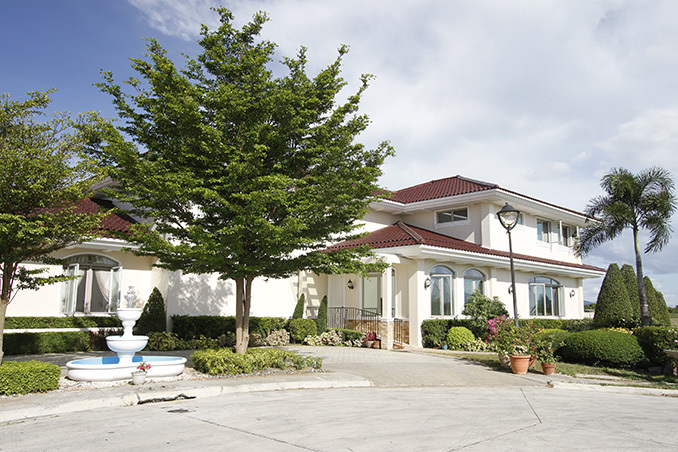 This impressive house has been featured on the primetime series Dolce Amore which airs on weeknights. While it served as the house of The Marchesas in the Philippines, it is the well-designed haven of the Ejercitos in real life. Spanning 1,200 square meters, this four-bedroom property makes the most of its expansive footprint and its strategic location. The house stands on a cul-de-sac or a dead-end street, facing a lake and offering a majestic view of Mt. Makiling. All things considered, this grand dwelling looks and feels like a private resort for the enjoyment of the owners. The success of this project can be attributed to both the homeowners and interior designer Joy Ejercito, who was tasked to come up with a modern French Mediterranean-inspired dwelling. In order to achieve the chosen style, heavy usage of earth tones were accentuated with bright neoclassical colors for a visual punch. The designer also filled the space with a variety of furniture pieces that imbibe elements of the preferred design style and fitted the interiors with frilly railings, carpets with elaborate prints, modern artwork pieces, and sunburst mirrors, to name a few. Aside from the well-appointed bedrooms that the kids of the owners and their families use, there are also common areas for the young and old, and special features like an infinity pool and an elevator. Suffice to say, this family home pulled all the stops.